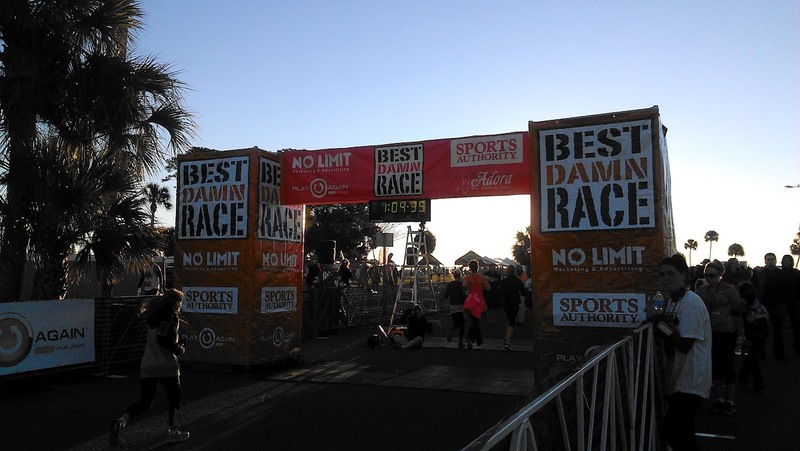 The inaugural Best Damn Race lived up to its name and all the hype. 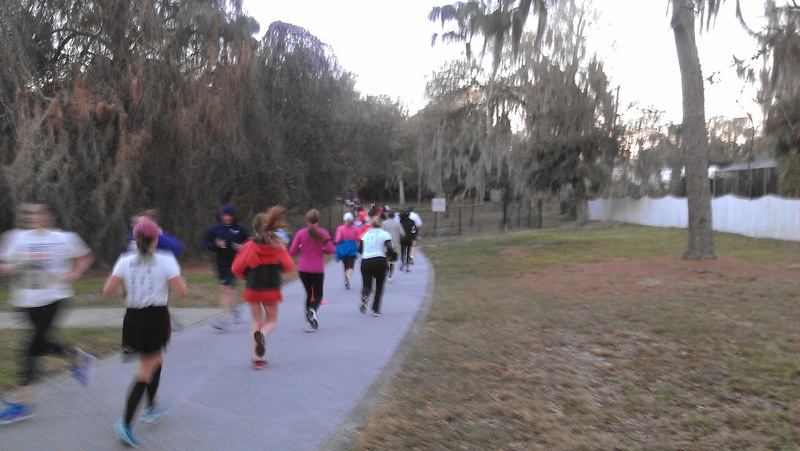 Since it was an early 6:30 a.m. start for the 10K on a frigid Florida morning, some layers were necessary. 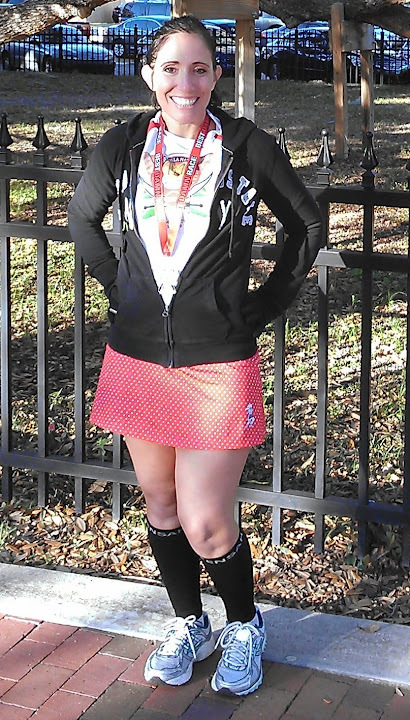 I decided to wear my new red polka dot running skirt from Running Skirts because it’s important for me (a stunner) to match the theme colors of the race. (I kid, but not really.) More importantly, the pockets would hold my cell phone, my lip balm (also necessary on a cold morning) and my MP3 player. 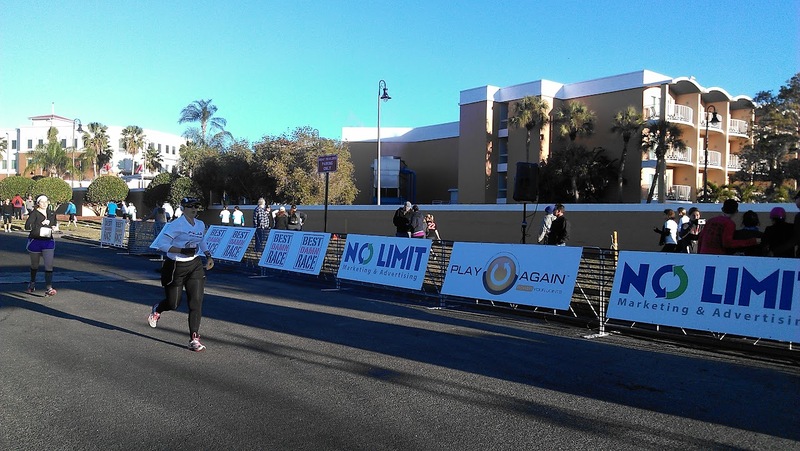 The start line was in front of the Safety Harbor Day Spa, which had a lovely toasty warm lobby and restrooms. 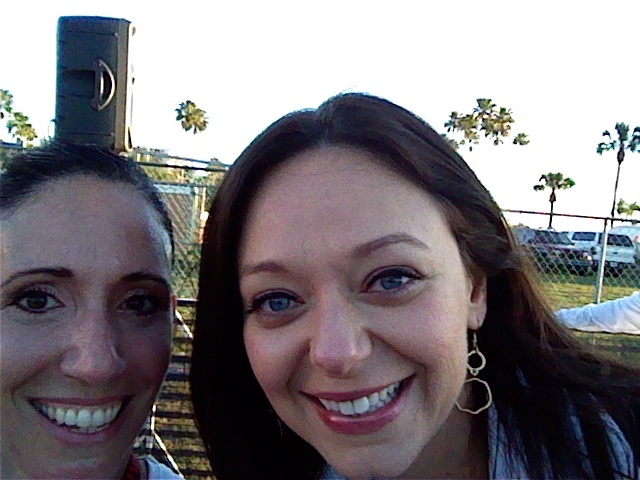 After the National Anthem sung by a woman that sounded a lot like Jennifer Hudson, we were off. 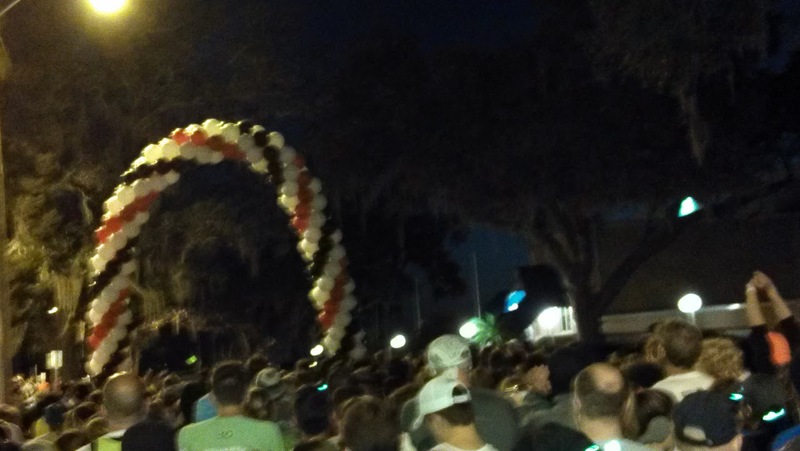 The first mile of the 10K course led us north along Bayshore Blvd and it was crazy dark. I just paced along with the people next to me until I looked down to check my pace and realized my Garmin wasn’t pacing along with me. UGH! I hate when that happens! So about three tenths of a mile into the race, I started my Garmin. 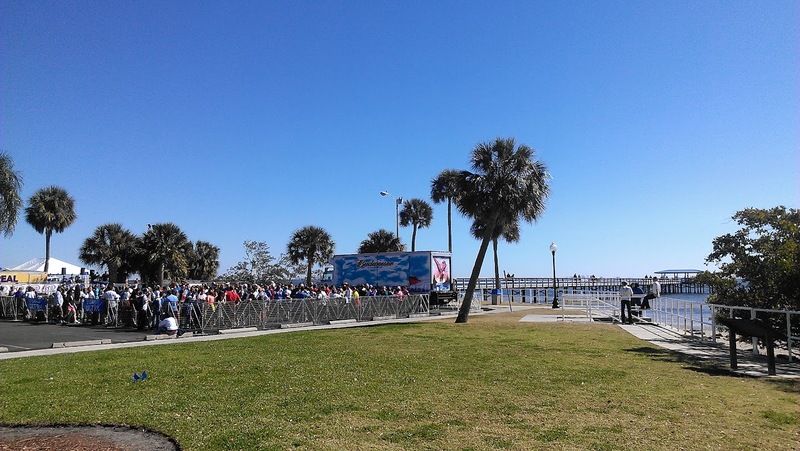 About the first mile, we turned, passed our first water station and then headed south on Bayshore Blvd. 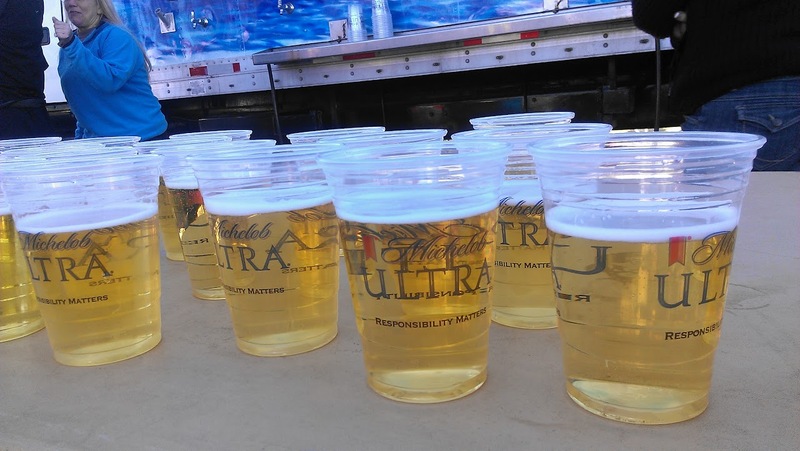 I was really surprised to see a water station so early into a race, but I happily stopped for some refreshments. Almost two miles into the race and we passed another water station. 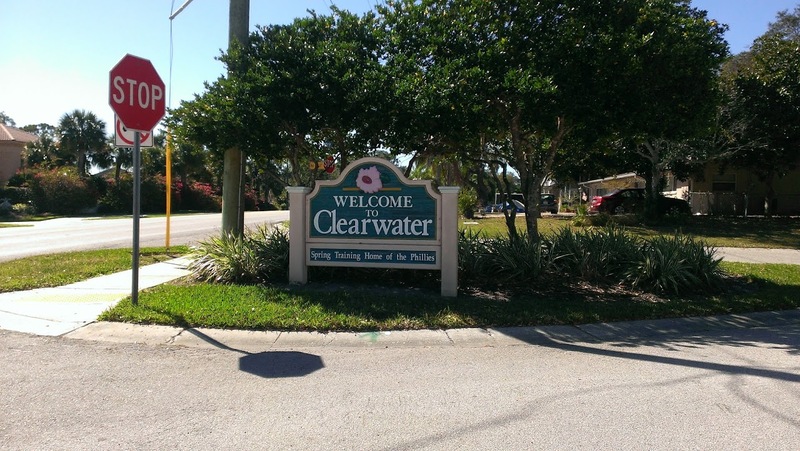 I skipped the water at this one, but I probably shouldn’t have because we were in for the longest stretch of the course with a slight incline into Clearwater. About three miles into the race, I started to become really warm from all my layers. When I reached the next water station between miles 3 and 4, I stripped off my long sleeve top. After the water station, we turned into a residential neighborhood which led us towards the Ream Wilson Trial. The light of dawn began to break through the trees, which a beautiful sight. 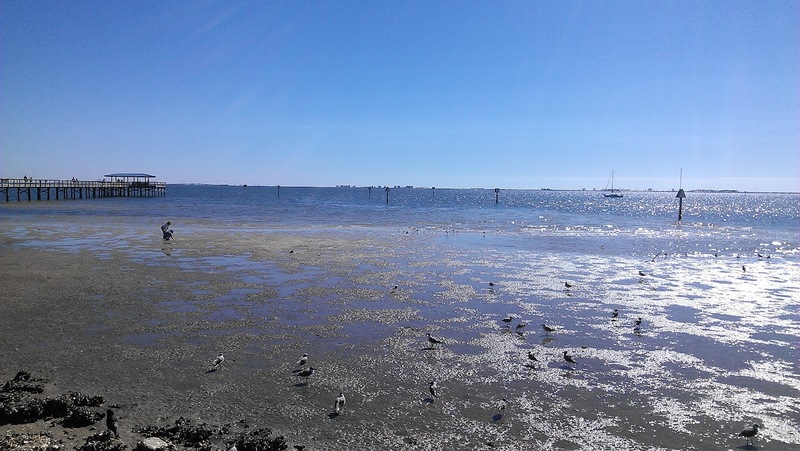 After our fun little exploration along the trail, we were led back to Bayshore Blvd. I stopped for some water and a few photos because I couldn’t resist the gorgeous peek-a-boo shot of the sunrise. 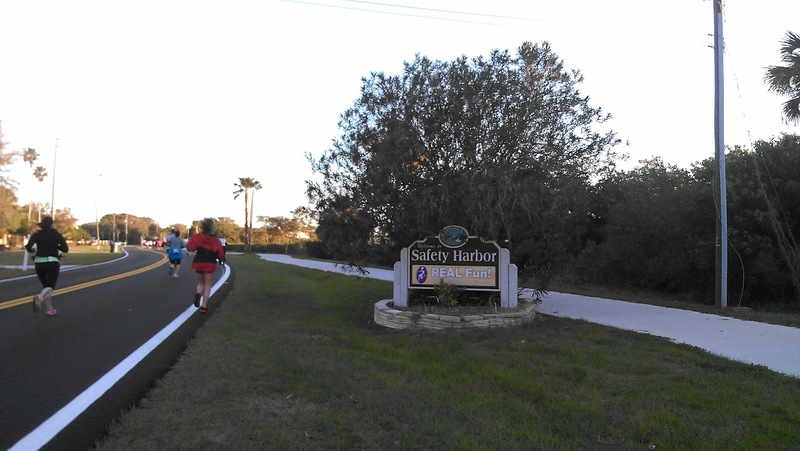 For that last mile stretch, we ran back into Safety Harbor. I pushed it for that last mile to finish strong. 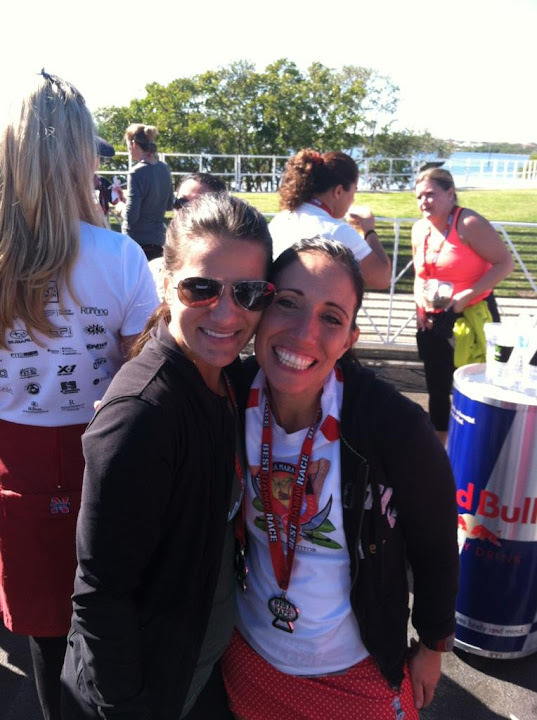 After sprinting across the finish line, my runner blogger friend, Beth, awarded me with a medal. Despite pushing it hard at the end, I actually finished a minute slower than my Race for the Cure 10K time. Damn. Oh well. On to the Best Damn Race post party with the best damn view of the bay! 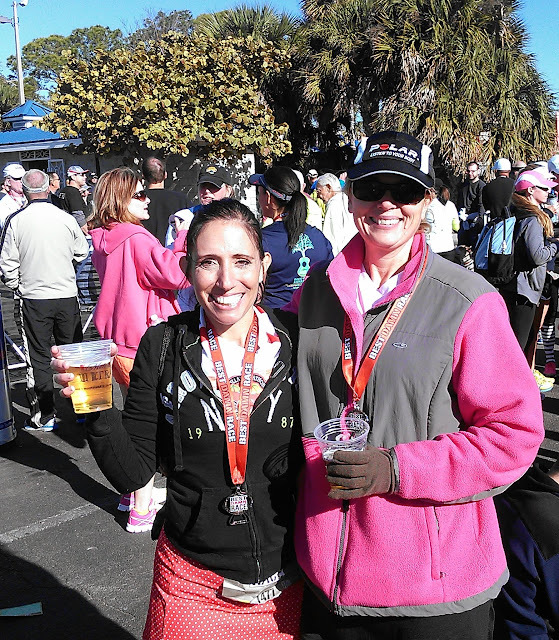 Jenny and Caroline also ran the 10K. 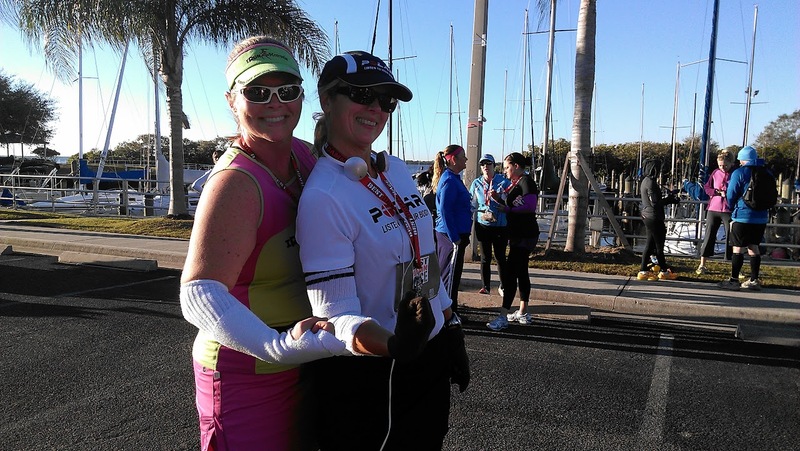 They finished smiling and strong with their cut-up tube sock sleeves. I bumped into so many friends at the race. It really was like a party because all my friends were there (except for the ones at Warrior Dash). Simply the Best Damn Race from start to finish! 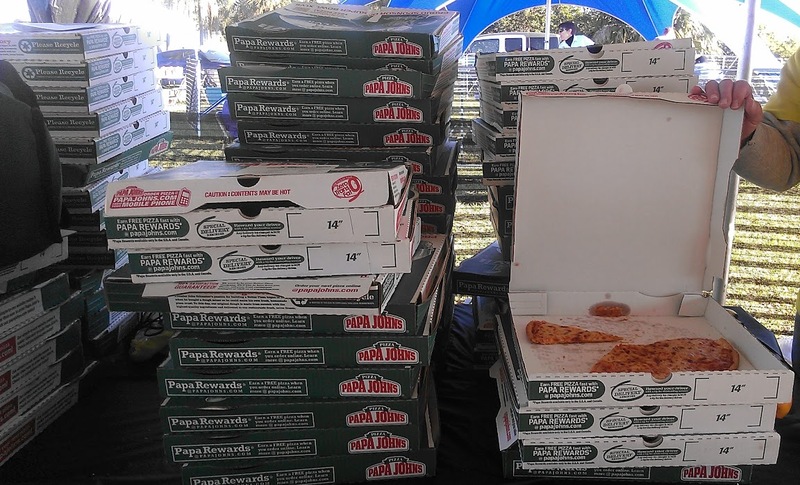 Not only was it a flawless event for a first time race, the food and beer was included in the registration fee (which was only $1 for me), not just snacks, although we had those too, but real food from Jimmy John’s and Papa Johns. Plus, it felt good to support a local race and friends instead of spending a fortune on a franchise race. I can’t wait for next year! 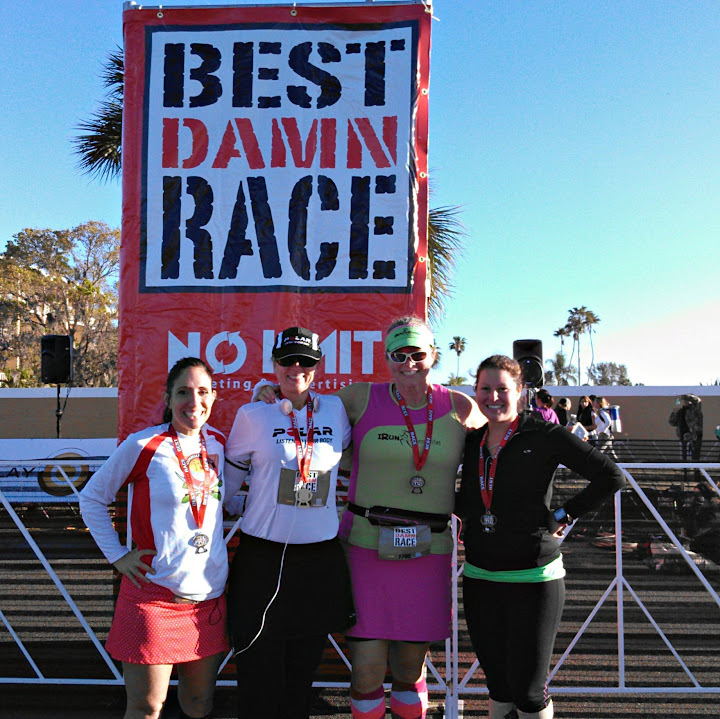 I’m hoping for a Best Damn Race Challenge to run all three races (10K, half marathon and 5K). Of course, I’ll run it to blog about it next year too. 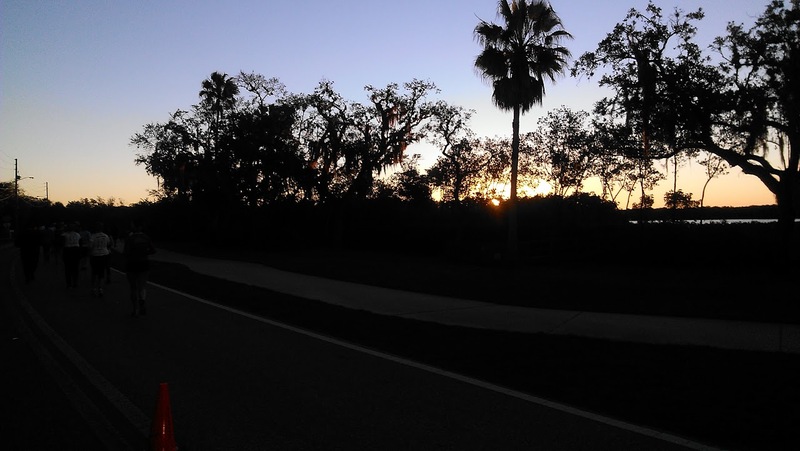 This entry was posted in bloggers, fitness, fun, Life, running, sports and tagged 10K, bloggers, Clearwater, Florida, food, friends, humor, miscellaneous, musings, race, random, recap, Run DMT, running, Safety Harbor, thoughts, travel. Ah beer. Ah, bananas. lol. awesome job girl, sad I missed this race! Great pics D! I waited until almost a week before the race to register because I wasn’t sure about the hip, but no worries – I didn’t mind the cost even at $65 it was cheaper than so many other races. EVERYTHING about BDR was put on super well. Next year though, I’m gunning for the $1!!! 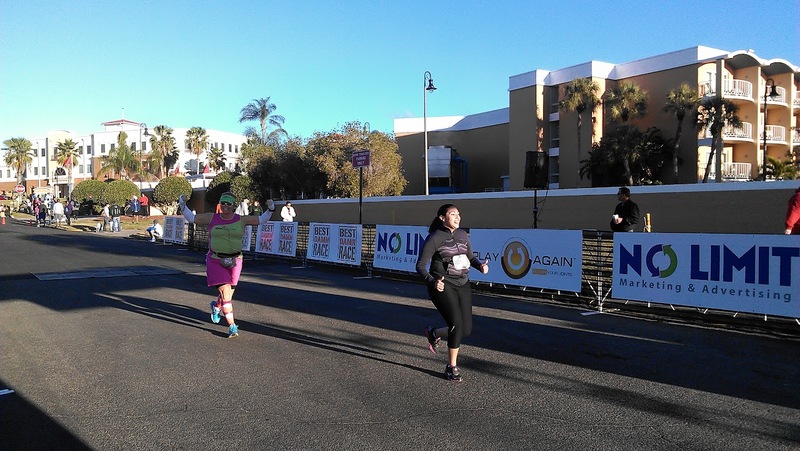 Nice job on this run Denise! And great pictures along the way! It was great to meet you, and I’m excited to start doing hills with you when I stop being so training plan obsessed! 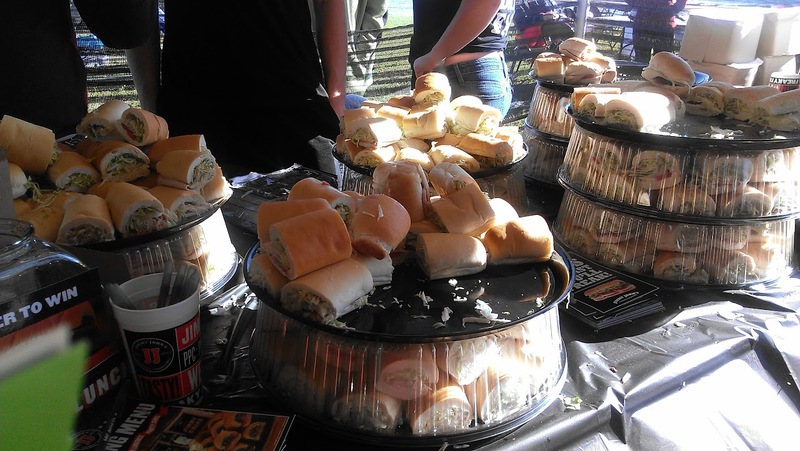 Are you going to be at RnR? Thank you! Yes, it was so great to finally meet you and I am looking forward to doing hills with you. Sounds weird to be excited about doing hills. lol No, I won’t be at RnR this year. I’m camping with girls’ troop. I loved this race!! It was so much fun! 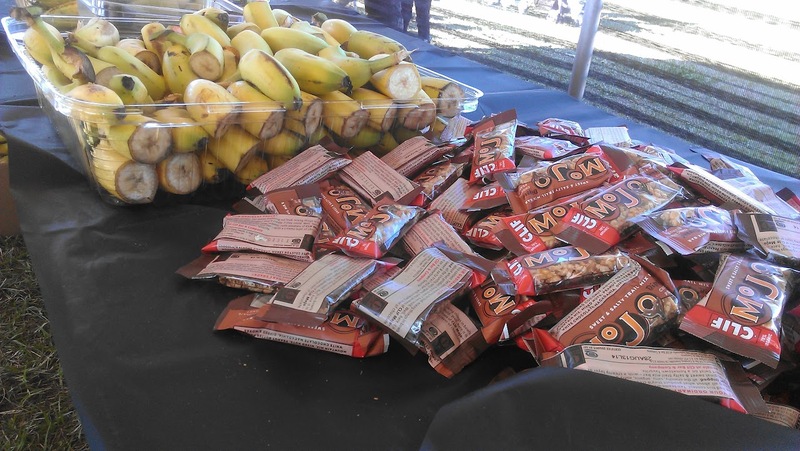 And I love hanging out with you pre and post race. You make me smile Next year I am going for $1, for sure!! Score! A $1 race?! You rock! I paid $35, and I still think it was a steal. 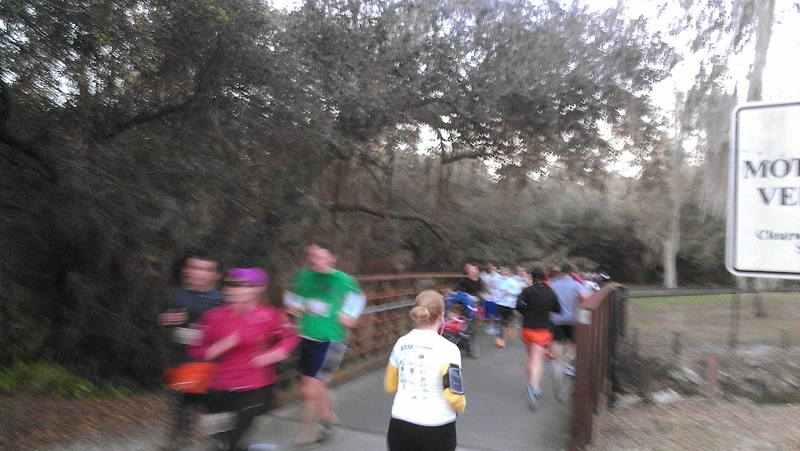 I loved this race … except for those pesky inclines in the neighborhood. I definitely want to do it again. We must have been close! I watched Caroline come in, too. Sorry I missed you!